New Delhi, India -- The word is close to my heart for two reasons. Having been born to Buddhist parents, I visualise the Buddha in a lotus. Secondly, Lotus is my son, so named after weeks of painful and indecisive deliberation. Besides, the lotus is our national flower, belonging to each one of us, whatever our faith (and not just the property of any political party). There are very good reasons for choosing it. Growing so flawlessly out of the mud, it symbolises beauty, purity, fragrance, prosperity and godliness. Padma, Dorje, Norbu, Kamal, Saroj, Neeraj, Pankaj, Rajiv and Rahul are some of its many word forms that live on in India as the names we have bestowed on our children, whether as Hindus or Buddhists. 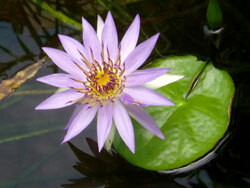 I am told that in Sanskrit, "lotus" also means genius or jewel. Buddhism attaches great importance to its beauty and the essence of purity and reasoning that it symbolises. That is why Buddhism lays great stress on living by reason and not by dogma. Buddha himself stresses that not to reason out things is like jumping into a deep well from which there is no coming out. Therefore, question even while keeping a positive outlook. Never accept things without prying into the deeper aspects so as to see the consequences that you may have to face. The lotus calls for an open mind that can be influenced only by positive and progressive thoughts and factors. So, beyond being the symbolic form of intelligence, purity and reasoning, the lotus is a vehicle for moral, intellectual, spiritual, social and political development. It addresses the problem of inertia, gullibility and credulity that hamper development in the basic human condition or mindset. It induces the thirst for knowledge and the urge to rise up to the next stage of empowerment and development. It helps shed dogmatism and bring in logic. This is lotus dharma.